Discussion in 'SS Help (Mod Questions Here)' started by kithawk, Apr 15, 2019.
ive had this issue for an extreamly long time, and it’s very frustrating. 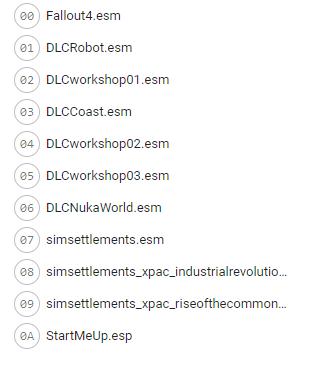 One: This issue is constant for me, I’ve completely reinstalled the game, shifted its stored location, removed all mods but sim Settlements and ROTC and requisite mods, and the issue still persists. Heck, my computer had a complete OS corruption and I completely reinstalled everything and the issue still persists. Two: The issue affects all settlements. Three: the installation of the mod isn’t the issue: I've manually installed it, used NMM, Vortex and Bethesda to install it, always to the same result. The issue itself is this: City plans build, and a select few plots such as outside agricultural and the occasional outside martial plot actually spawn. No other interior or exterior plots spawn. I don't mean they don't build. It says they build and even upgrade. But the plots, their markers, their buildings don't show up (ill post screen caps and other relevant information when I get home.) It’s extremely frustrating, It's like the hollow shell of a settlement builds but nothing populates it. It's not even like plots themselves can be built. Plots and all other SIm settlement related content works perfectly, but for whatever reason, ROTC does not place the vast majority of plots when building a settlement. I’ve heard people saying that they changed the number of threads the mod uses and that fixes issues, how does one do this and could this be causing the issue? I've used loot to clean the plugins and mods, and done everything I can think of to solve the issue. But it's always the same. Am I missing something? A quick question, how many settlers do you have? As a plan will only build plots for settlers present, it can also take some time after the initial build to start generating the plots. Depends s lot on how much demand is being placed on scripts. The same issue happens on all other settlements. How long should it take to generate plots? Depending on how far you are through the starting quests Preston may not yet be available to work yet (same with Codsworth, and he doesn't get much better). You have listed several work plots being generated, so some plots are appearing. As many as available workers? Is anyone showing as unemployed? Have they any residential plots? It depends on how the city plan was designed, but often plots won't appear unless there's someone there to occupy it. City plans only generate enough plots for the current population. So as your population grows so does the settlement. All SS mods are up to date? Yes, I’m even on a fresh instal. This issue just refuses to go away. Oh, this is Sanctuary. Could it be your settlers are getting their jobs satisfied by the gords across the street and watermelons behind the house? The Concord crew for god-knows-why are abnormally attracted to them. Before I build in SAN I remove them. "I think 3 - 4 gords and the watermelons". I remove them because they can really mess me up the early game when getting them to take to plots. I remove them before going to concord. + and make sure realistic build time is off in the halotape. sorry if someone already said this. You might like to add Hudframework to your mods https://www.nexusmods.com/fallout4/mods/20309/? This will give you more information about how settlers are being employed and how well their needs are being met. In the holotape you can also run a report that will tell you what plots are present. In workshop mode does it say if you have any beds or not? If things aren't showing up properly it may also help to try a refresh via the City Planner Desk (option on via the Blueprint on the desk) or after trying everything else you can try pulling it down and rebuilding (might kick something free). hahaha, vanilla beds or vegetables, its all good! Glad you got it figured out!